Map showing the present distribution of this weed. “Grassland, thicket, savannah and fynbos” (Van Jaarsveld 2006). “From sea level [and] to altitudes of over 6,000ft, always in rocky places, sometimes in dense bush, and at times on bleak exposed mountain sides, mostly in areas receiving 25-50 inches annual rainfall” (Reynolds 1969). “Montane grassland [and] in open evergreen forest, [and] also in coastal forest (1050-2800m)” (Kativu 2001). “Adapted to many habitats, but is usually found in mountainous areas where it favours exposed ridges and rocky outcrops” (Hankey and Notten 2004). Colours indicate possibility of Aloe arborescens infesting these areas. 1. Restrict human access? “Plants tall, many branched, arborescent shrubs 2-3m. high and about as broad… [Leaf] margins armed with firm (not horny or pungent) pale teeth 3-5mm long, 5-20mm distant, the teeth usually curved forward, smaller and more crowded near base, larger and more distant upwards” (Reynolds 1969). “The large spines on the leaves discourage escape of livestock, or intrusions by predators” (Weller 2008). “Summit thicket [includes] a mass of decumbent stem aloes (Aloe arborescens)... A. arborescens (Aloaceae) [is a] thicket-forming stem aloe” (Timberlake et al 2007). “Within these rocky outcrops Aloe arborescens is often prominent” (Regalis environmental services). The size and density of this plant, along with the toothed leaves would restrict access should it form a thicket. This could result in it becoming a major impediment to access waterways or machinery with significant works needed to provide reasonable access. 2. Reduce tourism? “Multiheaded shrub 2-3m high with striking grey green leaves arranged in attractive rosettes… The large colourful flower spikes are borne in profusion during the cold winter months (May- July), brightening up a drab winter garden.” Flowers coloured from deep orange to yellow (Hankey and Notten 2004). “Summit thicket [includes] a mass of decumbent stem aloes (Aloe arborescens)…A. arborescens (Aloaceae) [is a] thicket-forming stem aloe” (Timberlake et al 2007). “Within these rocky outcrops Aloe arborescens is often prominent” (Regalis environmental services). The plants would be noticeable, particularly when in flower; some recreational activities affected. 3. Injurious to people? “Aloe (Aloe spp.) extracts are used in many cosmetic and medicinal compounds. Unfortunately, some humans develop allergic contact dermatitis from this plant. Ingesting the plant latex can cause a cathartic action. Excessive doses may cause nephritis” (Canadian Biodiversity Information Facility 2008). “Margins armed with firm (not horny or pungent) pale teeth 3-5mm long, 5-20mm distant, the teeth usually curved forward” (Reynolds 1969). “The leave margins are armed with conspicuous pale teeth… In many parts of South Africa Aloe arborescens is planted around kraals (domestic stock enclosures) as a living fence… It is grown mainly as an ornamental or as an accent plant, but is also an excellent and impenetrable hedge plant” (Hankey and Notten 2004). The reports of this species being used as a ‘living fence’ in order to keep livestock contained, suggests that humans would find this plant uncomfortably prickly with these prickles being present on leaf margins all year round. 4. Damage to cultural sites? In “thicket communities [which include Aloe arborescens]…succulents often abound wherever the soils are shallow” (Regalis Environmental Services). “Multiheaded shrub 2-3m high with striking grey green leaves arranged in attractive rosettes… The large colourful flower spikes are borne in profusion during the cold winter months (May- July)” (Hankey and Notten 2004). Uncertain about root habit, plants seemingly unlikely to cause structural damage to buildings etc but given the size and flowering characteristics this plant would be noticeable anomaly depending on its location. 5. Impact flow? “Grassland, thicket, savannah and fynbos” (Van Jaarsveld 2006). “From sea level [and] to altitudes of over 6,000ft, always in rocky places, sometimes in dense bush, and at times on bleak exposed mountain sides, mostly in areas receiving 25-50 inches annual rainfall” (Reynolds 1969). “Montane grassland…and in open evergreen forest [and] also in coastal forest. (1050-2800m)” (Kativu 2001). “It is also found in dense bush” (Hankey and Notten 2004). This plant does not grow in aquatic situations. 6. Impact water quality? “Grassland, thicket, savannah and fynbos” (Van Jaarsveld 2006). “From sea level [and] to altitudes of over 6,000ft, always in rocky places, sometimes in dense bush, and at times on bleak exposed mountain sides, mostly in areas receiving 25-50 inches annual rainfall” (Reynolds 1969). “Montane grassland…and in open evergreen forest [and] also in coastal forest. (1050-2800m)” (Kativu 2001). “It is also found in dense bush” (Hankey and Notten 2004). 7. Increase soil erosion? “Montane grassland amongst rocks and in open evergreen forest, in the eastern border mountains and outliers with high local rainfall and drizzle (guti) in the dry season; also in coastal forest. (1050-2800m)” (Kativu 2001). “The krantz aloe is adapted to many habitats, but is usually found in mountainous areas where it favours exposed ridges and rocky outcrops” (Hankey and Notten 2004). As this plant grows among rocks and in coastal areas, it could indicate that it would hold the soil together where it grows. 8. Reduce biomass? “Grassland, thicket, savannah and fynbos” (Van Jaarsveld 2006).“The krantz aloe is adapted to many habitats” (Hankey and Notten 2004). “Montane grassland amongst rocks and in open evergreen forest, in the eastern border mountains and outliers with high local rainfall and drizzle (guti) in the dry season; also in coastal forest. (1050-2800m)” (Kativu 2001). The evidence suggests that this species may replace vegetation in a variety of vegetation types therefore biomass may increase or decrease depending on what species it will replace. There is not enough evidence to suggest either way. 9. Change fire regime? “Succulents may broil or bake, but they don’t burst into flames or spread them. Succulents are fire-retardant… [and] can’t carry a fire… As for those aloes, it appears their melted leaves protected the plants themselves; the centres of the rosettes are still a vibrant green” (HAD Insurance Brokerage).“Summit thicket [includes] a mass of decumbent stem aloes (Aloe arborescens)… A. arborescens (Aloaceae) [is a] thicket-forming stem aloe” (Timberlake et al 2007). “Within these rocky outcrops Aloe arborescens is often prominent” (Regalis environmental services). Could greatly change fire frequency and intensity as it does not carry fire and therefore stops it in its track. This is only if it is found on a large scale, as this information suggests, and would not apply to small stands or individual plants. (a) high value EVC EVC = Damp Sands Herb-rich Woodland (V); CMA = Glenelg Hopkins; Bioregion = Glenelg Plain; VH CLIMATE potential. “Woody trees also dominate the associated Thicket vegetation, [(including A. arborescens)] but it can be recognised by a lack of strata within the plant profile, with no trees emergent form its canopy and lack of a forest floor flora...Within these rocky outcrops Aloe arborescens is often prominent” (Regalis environmental services). 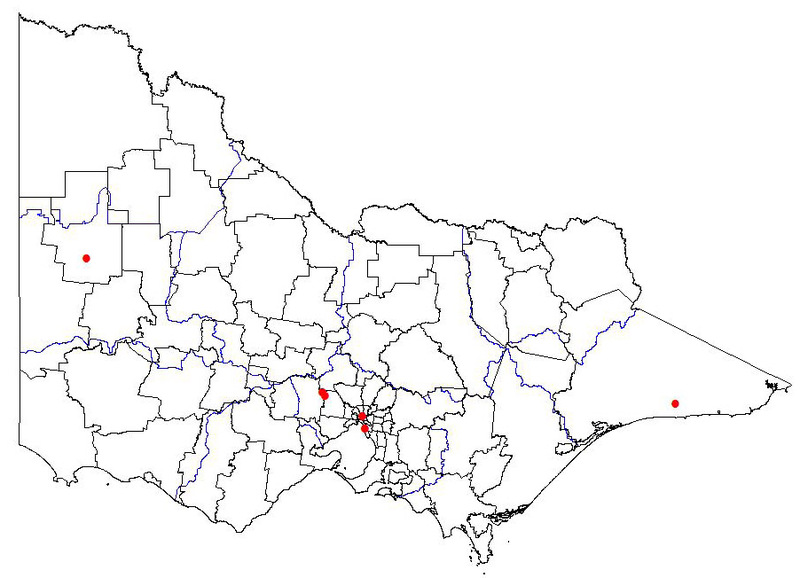 (b) medium value EVC EVC = Grassy Dry Forest (D); CMA = North Central; Bioregion = Goldfields; VH CLIMATE potential. 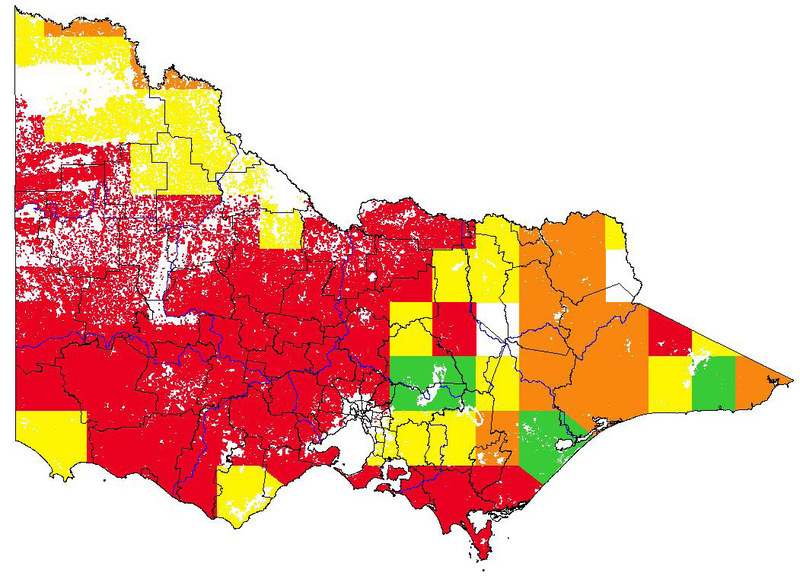 (c) low value EVC EVC = Wet Heathland (LC); CMA = West Gippsland; Bioregion = Wilsons Promontory; VH CLIMATE potential. 11. Impact on structure? “It is also found in dense bush… It is fast-growing” (Hankey and Notten 2004). “Plants tall, many branched, arborescent shrubs 2-3m high and about as broad. Stem up to 30cm. diam. at base many branched and rebranched from the base or higher” (Reynolds 1969). “Summit thicket [includes] a mass of decumbent stem aloes (Aloe arborescens)…A. arborescens (Aloaceae) [is a] thicket-forming stem aloe” (Timberlake et al 2007). “Woody trees also dominate the associated Thicket vegetation, [(including A. arborescens)] but it can be recognised by a lack of strata within the plant profile, with no trees emergent form its canopy and lack of a forest floor flora...Within these rocky outcrops Aloe arborescens is often prominent” (Regalis environmental services). - Given that it grows in thicket vegetation which lacks tall trees and forest floor flora and is often prominent, this species could have a major affect on all layers. 12. Effect on threatened flora? No information could be found. 13. Effect on threatened fauna? No information could be found. 14. Effect on non-threatened fauna? No information could be found. 15. Benefits fauna? “As with all aloes, the flowers produce nectar and are attractive to many kinds of birds; in particular the small and colourful sunbirds… The flowers also attract bees” (Hankey and Notten 2004). “Sunbirds and other nectar loving birds including bees cannot resist the flowers” (Nichols 2007). “Erect dense succulent shrub… Stem to 2m high, woody, branching from base and rebranching” (Godden 1993). “Plants tall, many branched, arborescent shrubs 2-3met. high and about as broad. Stem up to 30cm. diam. at base many branched and rebranched from the base or higher” (Reynolds 1969). Based on the above this species may provide some assistance in food for our native birds, bees and insects and possibly harbour for small animals. 16. Injurious to fauna? No information could be found. 17. Food source to pests? “As with all aloes, the flowers produce nectar and are attractive to many kinds of birds, in particular the small and colourful sunbirds… The flowers also attract bees” (Hankey and Notten 2004). “Sunbirds and other nectar loving birds including bees cannot resist the flowers” (Nichols 2007). Based on the above, this species may provide food for introduced birds and insects. 18. Provides harbour? “Plants tall, many branched, arborescent shrubs 2-3met. high and about as broad. Stem up to 30cm. diam. at base many branched and rebranched from the base or higher” (Reynolds 1969). Based on the above this species may provide harbour small mammals such as rabbits on a permanent basis. 19. Impact yield? No information could be found. 20. Impact quality? No information could be found. 21. Affect land value? No information could be found. 22. Change land use? No information could be found. 23. Increase harvest costs? No information could be found. This plant provides a food source to locusts which are considered to be a major pest of important agricultural produce. 1. Germination requirements? “Easily propagated from a branch or stem cut off [and] planted in well-drained soil or sand…Seed should take three to four weeks to germinate, and the seedling must be protected from frost” (Hankey and Notten 2004). Requires natural seasonal disturbances such as seasonal rainfall, spring/summer temperatures for germination. 2. Establishment requirements? “It enjoys full sun, well-drained, compost- enriched soil [and] then planted in well-drained soil or sand…Remember not to water the cuttings too heavily; over watering may cause them to rot… The krantz aloe is adapted to many habitats, but is usually found in mountainous areas where it favours exposed ridges and rocky outcrops. It is also found in dense bush” (Hankey and Notten 2004). “Easily grown, full sun” (Van Jaarsveld 2006). Although it favours sunny positions it can be found in dense bush and therefore it is assumed it can establish under moderate canopy/litter cover. “A species of montane grassland.” (Hyde and Wursten 2008) “Montane grassland amongst rocks and in open evergreen forest …also in coastal forest. (1050-2800m)” (Kativu 2001). “The krantz aloe is adapted to many habitats, but is usually found in mountainous areas where it favours exposed ridges and rocky outcrops. It is also found in dense bush” (Hankey and Notten 2004). As this species grows in dense bush and mountain fynbos (equivalent to heathland) in its natural habitat; it may establish similar healthy and undisturbed natural ecosystems such as alpine and heathland in Australia. 4. Life form? Large multi-stemmed shrub (Gutterman and Chauser-volfson 1999) to 1.5-2m high (Van Jaarsveld 2006; Godden 1993). 5. Allelopathic properties? No specific mention of any allelopatic properties in any literature seen (e.g. Kativu 2001; Reynolds 1969; Hankey and Notten 2004), however there does not appear to have been much research done on this plant. “Grassland, thicket, savannah and fynbos” (Van Jaarsveld 2006). “It is also found in dense bush” (Hankey and Notten 2004). This information suggests it is not allelopathic as it is found in dense bush and thicket. 6. Tolerates herb pressure? “The most frequently encountered arthropod pests that damage aloes grown commercially include mealy bugs, scales, beetles and mites. Other groups of insects that can damage aloes include locusts and aphids. At the Royal Botanic Gardens, Kew, thrips have also been observed feeding on the flowers” (Reynolds 2004). “This may deter animals such as elephants and kudu from eating the new growths. They may prefer to eat other plants that have not been damaged by consumption for longer periods. This phenomenon may give damaged plants the chance to renew themselves before their leaves are consumed again” (Gutterman and Chauser-Volfson 1999). 7. Normal growth rate? Hankey and Notten (2004) and Van Jaarsveld (2006), both describe this as a fast growing species in their respective works. Based on this information it is assumed that this species has a rapid growth rate that will exceed most other species of the same life form. 8. Stress tolerance to frost, drought, w/logg, sal. etc? “Enjoys well drained, compost enriched soil and can tolerate moderate frost but is sensitive to severe frost…It will tolerate drought and neglect once established… Remember not to water the cuttings too heavily; over watering may cause them to rot” (Hankey and Notten 2004). In general, succulents’ “fleshy leaves, stems or roots provide water reserves to carry them through the dry season.” This species grows in “warm temperate to subtropical, tolerant of mild frost” (Van Jaarsveld 2006). ‘With their succulent leaves [these plants] are well suited to absorbing [the heat from burning firebreaks] without lasting damage to the plants” (Nichols 2007). Although this species is said to grow “among rocks to protect itself from fires” (Hyde and Wursten 2008), An insurance company reports that following a fire the aloes’ “melted leaves protected the plants themselves; the centres of the rosettes are still a vibrant green” (HAD Insurance Brokerage 2007). “Growing conditions: Drought tolerant plants, Salt tolerant plants” (Philips and Rix 2008). Tolerates drought and salinity and some tolerance of fire and frost. Possibly susceptible to water logging. 9. Reproductive system “At almost every locality where A.arborescens grows socially with other species of Aloe, and both flower at the same time, crosses are almost inevitably found” (Reynolds 1969). “Many succulent cliff-dwellers [and A. arborescens is one] clone themselves naturally by producing either vegetative propagules (offsets) or rooting along their nodes where they touch a crevice” (Van Jaarsveld 2006). Aloe arborescence produces roots up along its branches and when in contact with the ground; ie. Heavy branches leaning or pieces broken off from the main branches, will take root (D. Joubert, pers. comm.). 10. Number of propagules produced? “Racemes… densely flowered, [and] in no locality in South Africa is A.arborescens found as a solitary plant with simple stem… A. arborescens is always a much-branched arborescent shrub” (Reynolds 1969). Drawing in Palgrave (1977) shows 7 rosettes on A.arborescens and states that there are usually two to four flowers per rosette. “Raceme 2-4, conical, to 80cm long, 60-125-flowered” (Godden 1993). “Capsule 17-18x 7mm, seeds 1.75x3.5mm” (Kativu 2001). 1250 seeds per raceme multiplied by 4 raceme spikes per rosette= 5000 seeds. More than 2000 seeds produced. 11. Propagule longevity? No information could be found. 12. Reproductive period? No information could be found. 13. Time to reproductive maturity? Will flower from approximately 2 years old in Victoria in a garden situation (D. Jourbert, pers. comm..). For the purpose of this assessment it will be assumed that this species will produce seed from the first time it flowers in 2-5 years. 14. Number of mechanisms? “As the inflorescences sway in the wind the seeds, which are winged, are thrown out and blown away” (Reynolds 2004). Propagules spread by wind, though not far. No mention of dispersal by birds or animals. 15. How far do they disperse? “Wind-dispersed seeds [of Aloe spp. ], whether aided by specialized appendages or not, generally move short distances from the parent plant… For a conservative estimate of wind speed during seed dispersal as 6m s-1, the predicted dispersal distance becomes three times the height of release” (Stokes and Yeaton 1995). A. arborescens is an “erect dense succulent shrub to 3m high when in flower” (Godden 1993) with winged seeds (Kativu 2001) that “are thrown out and blown away… as the inflorescences sway in the wind” (Reynolds 2004). “Sunbirds and other nectar loving birds including bees cannot resist the flowers” (Nichols 2007). 3m (height of plant with inflorescence) x 3 (dispersal distance) = 9m dispersal range. Very unlikely seeds will disperse greater than 200m, most less than 20m. Information also states flowers are visited by birds and bees but there is no evidence to suggest that they disperse seed. Palgrave.K (1977) Trees of Southern Africa. C. Struik Publishers, Cape Town Johannesburg. Reynolds.G (1969) The Aloes of South Africa. A.A.Balkem, Cape Town. Reynolds.T (2004) Aloes: The genus Aloe. CRC Press. Van Jaarsveld E (2006) Cultivation of South African and Manibian Cliff-dwelling succulents with pendent growth forms. Cactus and succulent journal 78, 268-304.
http://www.anbg.gov.au/avh/ (verified 11 November 2008). Global Biodiversity Information Facility (GBIF) (2008) Global biodiversity information facility, Available at http://www.gbif.org/ (verified 11 November 2008). Do you have additional information about this plant that will improve the quality of the assessment? If so, we would value your contribution. Click on the link to go to the feedback form.